I hope someone will get back with you soon. Since I have some surplus funds, I've gone ahead and submitted a request to Parcl for the goods. I've got 11 items ordered for now, including the frightmare wystearya wanted and the Rochelle Knightfire requested. I know Claire tried to order from there but nobody responded, so maybe my order will attract some attention. OK, well the Frightmare I want is the top left. Blue horse body, with white 'human' face. For anyone interested in ordering some of the dolls from Miramida's site, I'm taking orders for a potential June order via Parcl in the Sales section. I hope we can. I'd love one of the full size Frightmares! So, uh, is there a color choice or is it random? Just trying to be sure, as some of the colors I don't like at all. I *assume* there is a choice of color? Anyway, yes, depending on cost I would want at least one if not two. Can we post a link to this in the Fakie thread? << Or is that allowed? 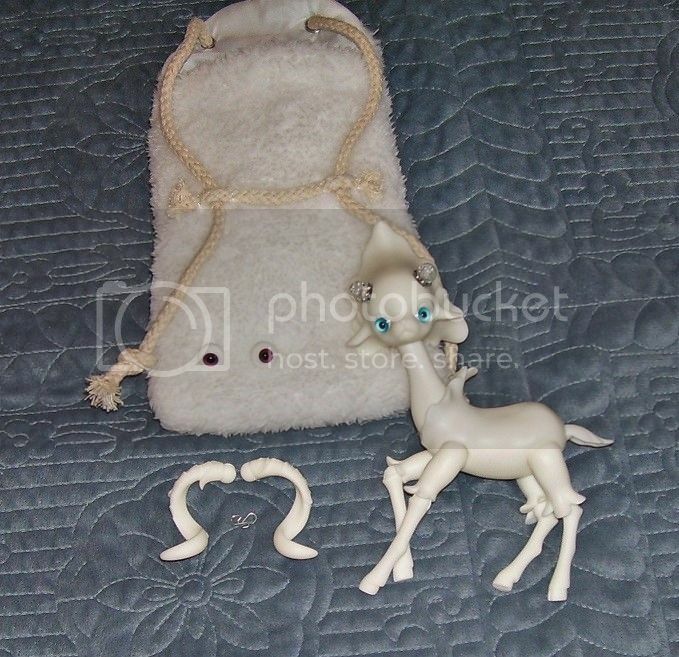 Sales / Re: Dollzone Big Dipper BJD for sale! I *may* go to eBay if I don't get any interest in a week or so. Though, I would *much* prefer to avoid eBay! Everything else I kind of expect from the reboot/dolls aimed at a younger market, but those hip joints look horrific. I wondered about the hips/thigh gap thing. But I thought maybe it was just me. But yeah, not sure what to think about the hips on these. Here are HD promo pictures of Toralei! Oo, is that a tiger face on her butterfly wings? Cool. The faces do look better. But less joints and painted on clothing = a big NOPE from me. But, if there is a way to get a group order, please let me know. I would like to get one if it's possible! I love the last one in the top row, the silver/white one with blue hair. Depending on total cost I may be interested in a group order. "Full Articulation" on these Frightmares is?? Like Avea Trotter or?? Monster Discussion / Re: How has your monster collection evolved? I actually didn't have any dolls before MH. I didn't like Barbie, Brats, etc. (I was into My Little Pony as my main toy to collect.) But when I started seeing the MH dolls I was interested. Signature Spectra was my first, and is still my favorite MH doll. I collected for myself, for the fun of it. I enjoyed the range of motion in these dolls, and the clothes, the themes. Lots of fun to 'play' with! But now, I have lost most interest. I have given most of my dolls to my stepdaughters. I kept a few favorites. I mostly have them now as something to play with my stepdaughters. The MH line, in my opinion, has gone downhill. The clothes are mostly all one-piece mini dresses. The themes seem either tired or under-done. Some of the budget dolls now don't even have full articulation. And my newest purchase (made yesterday) seems to have very stiff joints. I can't even get the hips to move outward. So, I am not sure if the jointing has been made so there is less range of motion, or if they are getting more cheaply made. But I am disappointed in the newer dolls. I don't see myself collecting anymore. But this is not just for MH dolls. I have lost interest in collecting in general really. I've sold or donated many of my old toys. I plan to keep getting rid of them too. I feel better with less *stuff*. This is a personal journey, and one I have enjoyed making. I believe I will always love toys in general! I do love to browse the toys isles, even if I don't make any purchases. I am sure I will pick up the odd toy here and there for the foreseeable future. But as far as a true collection, I am over that chapter of my life. I see myself now as more of a person that appreciates quality (or cute) toys. But no longer a collector. I've been feeling the same way for months. But the other day I saw Party Ghouls Abbey... and she's hard to resist. I didn't buy her, but I may yet give in. Same here! I almost bought her too, but passed. I already have/had a few different Abbey dolls and didn't feel like I *had* to have her. But, it was close! I did *finally* buy a new MH doll today (Silvi Timberwolf). But before today, I honestly don't remember the last MH doll I bought. I've given most of my dolls to my stepdaughters, save for a few old favorites. I didn't know if I would buy any more new dolls or not. Like you, the new dolls just lack that *something*. Don't have much advice other that to wait and be sure before selling your dolls. Even if it is "the end" for you, hopefully you enjoyed them to the fullest and will be happy with whatever you move on to next. Or maybe you will find renewed interest sometime down the road. Either way, best of luck to you!! Nope, I have a 'dumb phone' and I love it. I like to tell people that my phone makes phone calls. lol! It's a cell/mobile phone, but basic. It's cheap, I bought it, and the plan is cheap. Battery lasts forever. I can text or talk. It's all I need. If I want online, I want on a screen big enough to see.